Following their break-up, a struggling stand-up's girlfriend is stricken with a mysterious illness. If you don't like having your laundry aired in public, dating or marrying a comedian probably isn't a good idea, as you can expect the most intimate details of your relationship to find their way into your other half's material. For his first feature screenplay, comic Kumail Nanjiani has collaborated with his wife, Emily V Gordon, to bring a very personal tale to the screen, that of the latter's succumbing to a mystery illness at an early point in their relationship. In The Big Sick, directed with TV drabness by Wet Hot American Summer's Michael Showalter, Nanjiani plays a fictionalised, somewhat younger version of himself, while Zoe Kazan fills in for Emily. The two meet when Emily cheers on Kumail during one of his routines at the Chicago comedy club where he hones his planned trade in between working as an uber driver. The two hit it off almost immediately, and romance soon blossoms. Looming like a rain cloud over the relationship however are Kumail's conservative Muslim parents, who have their minds made up that their son will marry a nice young Pakistani girl - his mother awkwardly arranges for potential suitors to 'drop in' during dinner, leaving headshots and resumes with Kumail as if they were auditioning for an off-broadway production. When Emily discovers said items collected in a tobacco box in Kumail's apartment, a blazing row ensues, and she storms off. That night, Kumail receives a phone call informing him that Emily has been rushed to hospital. When he arrives to be at her side, she is still belligerent towards him, but with none of her family in town, Kumail is forced to sign a form to allow the doctors to place her in a coma. Things become even more stressful when Emily's parents (Holly Hunter and Ray Romano) arrive on the scene. 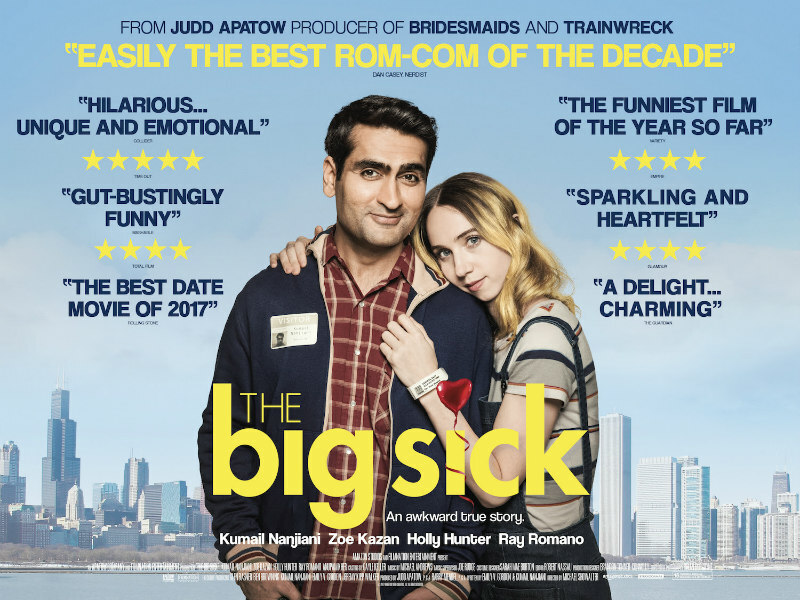 The Big Sick has been hailed in the US as some sort of second coming of the rom-com, but it suffers from the same glaring issue as most examples of the sub-genre. Despite being written by a real-life couple, we're presented solely with one side of the story, seeing everything through Kumail's eyes. Emily is little more than a prop, practically non-existent outside of her relationship with Kumail, and she has as much agency while in a coma as while awake. Early on we see her devote herself to Kumail, cheering on his stand-up routines, enduring the b-horror movies he forces upon her, putting up with his health-hazard apartment and sitting through his painful one-man show on the Pakistani experience. As presented here, the relationship appears to be one of give and take, with Emily doing all the giving and Kumail all the taking. He never seems to spend any time indulging in Emily's interests, and while we see practically every aspect of Kumail's working and social life, Emily only exists when in her boyfriend's presence. When the relationship goes sour, Kumail's attempts to win her back come across as misguided and narcissistic, essentially guilt-tripping her into taking him back as a reward for his devotion. Kumail sounds off about his love for Emily to her parents, his friends and even his stand-up audience, but the film never affords Emily the same platform - what's her take? Thankfully, Nanjiani is such an affable and genuinely amusing presence that his charm goes a long way to papering over this considerable crack. The film is strongest in its middle section, which focusses on Kumail's befriending of Emily's parents and his struggles with his own family. With Emily out of the picture, the fact that the central couple appears incompatible doesn't prey on our minds so much, and we can sink back in our chairs and enjoy the one-liners and tender moments of human observation. The relationship between Kumail and Emily's mom and pop, who thankfully aren't portrayed as the bigoted rednecks a lazier comedy might opt for, has all the charm and verisimilitude lacking from the central relationship. Writing and playing a version of himself roughly 15 years younger than his current age, Nanjiani nails the life of a single twenty-something male, a mix of career ambition and personal nonchalance. Little details, like how all the electrical items in his apartment are the cheapest brands possible and his boast of cleaning his bedroom "earlier this year", will have the men in the audience grinning with embarrassed acknowledgement. It's a shame the women aren't afforded the same level of insight. The Big Sick is in UK/ROI cinemas July 28th.